Opium harvest in a poppy field in Badakhshan, Afghanistan. Raw opium is cooked before being suitable for smoking. 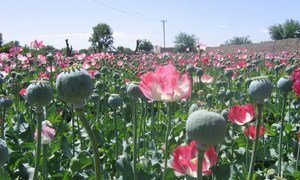 Opium poppy cultivation in Afghanistan decreased 19 per cent in 2015, compared to the previous year, according to the latest Afghanistan Opium Survey figures released today by the Afghan Ministry of Counter Narcotics and the United Nations Office on Drugs and Crime (UNODC). The findings show that the area under opium poppy cultivation in 2015 is around 183,000 hectares (ha), compared with 224,000 ha in 2014, while the cultivation area has decreased for the first time since 2009. The survey further notes that in 2015, potential opium production in Afghanistan amounts to 3,300 tons, a decrease of 48 per cent from its 2014 level (6,400 tons). The average opium yield meanwhile is at 18.3 kilograms per hectare (p/ha) - 36 per cent less than in 2014 (28.7 kilograms p/ha). Despite these noted decreases, the number of poppy-free provinces fell in 2015, specifically in the Northern region with Balkh losing that status which it had regained in 2014. Meanwhile, UNODC reports that Hilmand, with some 86,400 ha (47 per cent of the national total), remains the country’s major opium-cultivating province. This is followed by Farah (21,106 ha), Kandahar (21,020 ha), and Badghis (12,391 ha). As noted in the survey, opium cultivation decreased in most of the main opium poppy-growing provinces, notably Nangarhar, Nimroz and Kandahar (which saw declines of 45, 40 and 38 per cent, respectively), but climbed in the provinces of Badghis (by 117 per cent) and Uruzgan (by 22 per cent). The UN is also highlighting that as in previous years, the available technology used to conduct the crop monitoring and assessment between 2014 and 2015 has again been refined and sharpened, leading to greater accuracy of estimates but which may have an impact on the extent of year-on-year changes. Regarding the southern region, it reportedly has the country’s largest share of national opium production with 58 per cent recorded, which equals some 1,900 metric tons (MT). UNODC finds Afghanistan’s second most important opium producing region to be the west, responsible for 22 per cent of national production (720 MT), followed by the eastern region with 13 per cent (450 MT). The remaining areas (north-eastern, northern and central regions) together account for less than eight per cent of opium production. According to the survey, the low production can be attributed to a reduction in area under cultivation, but more importantly to a drop in opium yield per hectare. This yield decreased in all main opium poppy cultivating regions, led by the southern region, with a 45 per cent decrease, followed by the western region (20 per cent) and the eastern region (eight per cent). In terms of eradication, efforts across the country led by the various provincial governments increased a collective 40 per cent, compared to last year, or from around 2,700 ha to 3,760 ha. During the latest eradication campaign, there were fewer casualties reported than the previous year: in 2015, five lives were lost and 18 persons were injured compared to 2014, when 13 lives were lost and 26 persons injured. Opium cultivation and production in Afghanistan reached record levels this year, with the former increasing seven per cent to 224,000 hectares in 2014, and production levels potentially climbing as much as 17 per cent, according to the United Nations Office on Drugs and Crime (UNODC).